New on the experimusic YouTube channel! John White’s performance of five of his sonatas at the Keyboard Experiments concert at De Montfort University, Leicester, 25 March 2017. This was the Saturday afternoon recital of the CoMA East Midlands EMC² Festival, celebrating nearly 50 years of the Experimental Music Catalogue. There is a slight cut-out during Sonata 140 due to a cut in video files, but this should only slightly inconvenience what is a rare video performance by John White, as brilliant a pianist as he is a composer. Filmed by Connor McCormack. Programme note: “John White has been writing piano sonatas since 1956 as a form of diary documenting his musical thinking at the time. Most of these sonatas reflect the short-form sonata from Scarlatti, and the musical thinking of Satie, with a dizzying range of individual concerns including experimental, systems and minimal, and popular musical language, and a consistent fascination for the musical thinking of piano composers from the late nineteenth to early twentieth century, from Alkan to Medtner. This set of sonatas provides a taste of his post-millennial style, with one classic from the 1980s” [Virginia Anderson]. 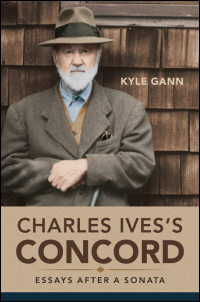 Kyle Gann’s new book, Charles Ives’s Concord: Essays after a Sonata (University of Illinois Press), is out and is no doubt of great interest to all Ives fans, scholars, and pianists. On Jems, the peer-review journal hosted by the EMC, Chris Hobbs checks out this book, using fifty years of familiarity with the piece. * You can find his findings here in the review section of Jems. *(A funny story: Hobbs performed the “Thoreau” movement for his entrance audition to the Royal Academy of Music in 1967. One of the examiners was the composer Alan Bush, who looked at the score and said something like, “Don’t know this piece. How am I going to know if you play a wrong note?” For the exact anecdote, buy Chris a beer and he’ll tell you…).